We are extremely excited to announce that we are finalists for not one, not two but three awards at HJ’s British Hairdressing Business Awards! Paul Edmonds London has been named a finalist for BHBA’s Customer Care Award and Salon of the Year whilst, junior stylist Matilda Marshall finalises for Junior of the Year. The Customer Care award celebrates those hair salons who excel in providing the perfect client journey. At Edmond’s salon we offer our clients a luxurious and homely experience from the moment they enquire; our flawless online booking system and five star in salon experience will leave every customer feeling pampered until their next visit. The Paul Edmonds family in our London Salon couldn’t be prouder! Our home grown superstar Matilda Marshall has been nominated for Junior of the Year at the British Hairdressing Business Awards 2017. Paul Edmonds London put Matilda forward for this fabulous award, and after completing a thorough application she was announced a finalist, standing out from hundreds nominated in the hairdressing industry. Growing up in Somerset, Matilda longed of working in the capital pursuing her dream of becoming a hair stylist. 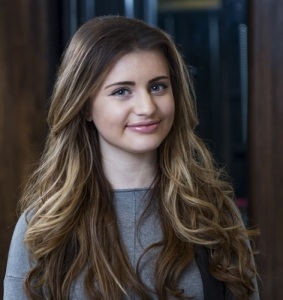 The day of her interview, aged 16, Matilda travelled from the South West to our luxury beauty salon in Knightsbridge, where she immediately showed passion and love for the career she was so motivated to kick start. Matilda came to us as an A* student and her maturity, conviction and commitment to hairdressing enabled her to stand out from the crowd. From that moment, we knew how amazing she was going to be. Five years later Matilda is more motivated than ever, “I love working with people, which entails both clients and the Paul Edmonds London team.” Matilda wants to be known for making an impact in the industry and be a recognised name in the hair industry. Matilda’s commitment to the hair and beauty industry has enabled her to gain a vast amount of experience, training and qualifications. Matilda has successfully completed training in house focusing on the day to day runnings of our Brompton Road salon, including; product training with our big brands such as L’Oréal, Kerastase, Shu Uemura and Beauty Works. Matilda has already started to make a name for herself within the hair industry by assisting on various well known hair shows. Matilda has graced the stage with Anthony Turner, Matt Mulhall, Britain’s Next Top Model and Cosmopolitan. “I admire a lot of the people that I work with, I am fortunate enough to have become what Paul calls his side kick” meaning that the limit to Matilda’s oppertunities are basically endless! Matilda has such an amazing future ahead of her and we wish her all the luck in the world, fingers crossed Matilda will be your new Junior of the Year! To book an appointment with Matilda, please click here. You can check out all of the BHBA Finalists here. If you’d like to book an appointment at Paul Edmonds London in Knightsbridge, then book online or do not hesitate to get in touch.